Mark Webber claimed his first pole position of the 2013 season at Suzuka, with a qualifying time of 1min 30.915secs, beating team-mate Sebastian Vettel to top spot. It was the first time this season that Vettel has been outqualified by his Australian team-mate, who departs from Formula 1 at the end of the 2013 season. Vettel's first Q3 lap was scuppered by a KERS failure on his Red Bull. Even though the team managed to repair the car in time for his second run, it wasn't enough to beat Webber's time. This was Webber's first pole position since the 2012 Korean Grand Prix. Lewis Hamilton took his Mercedes AMG F1 to third on the grid ahead of Romain Grosjean's Lotus and Felipe Massa's Ferrari. Nico Rosberg brought the second Mercedes home in sixth place, just ahead of Nico Hulkenberg and Fernando Alonso who qualified seventh and eighth. It wasn't a particularly good qualifying session for Kimi Raikkonen who could do no better than ninth place, while Jenson Button took the final top-10 spot. Webber is currently under investigation for impeding a rival competitor in Q2, and should he receive a penalty for the same, it could see him lose pole. 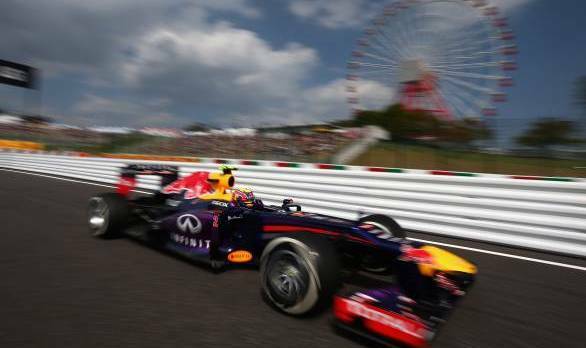 Meanwhile Sebastian Vettel heads into the Japanese Grand Prix quietly confident. Should Vettel win the race, with Fernando Alonso finishing ninth or lower, the German driver will win his fourth consecutive world championship title.